Friend. Can we chat for a minute?! I am completely blown away by how much you love these meal plans. Seriously, THANK YOU for sharing these plans with your family and friends, emailing me, sharing on Instagram and Facebook and for whatever way you spread the word about these meal plans. I’m filled with gratitude and will continue to work hard to provide great meal plans for you….including this next one. I absolutely adore the meals and recipes that are in this plan. If I had to make a list of our family’s top 20 meals, all of these would be on that list. These are tried and true recipes, some that have been around for years and other newbies that will not disappoint. I wanted to add a note that these are NOT the same as the slow cooker freezer packs from the last plan…these are sauces and roasts with marinades and other dishes that are freezer friendly! I’ve pieced together another amazing plan with favorite recipes that will not disappoint! And to answer the burning question of why these dinners are more than your typical $5 price point…I realize this makes for roughly $7.50 dinners. Meat at Costco is more expensive than sale prices at grocery stores, and many argue that the quality is better, which according to their policy of only carrying Choice and Prime grade meat makes sense! If you have other questions about these plans, you can learn more on our 20 Meals for $150 Plan’s FAQ & ‘Disclaimers’ page. We made dramatic changes to the Assembly Process & Instructions and they will be much more clear for you to use as you assemble and cook the meals in this plan. We had a professional come in to shoot the videos of the assembly process…no more blurry screen and difficult times hearing me…the downside of shooting videos in your kitchen from my laptop! I brought the big guns in and you’re going to love these exclusive videos (and all the ‘live bloopers’ too)! We are offering a gluten-free version of this plan. Now, let’s dig into the plan…. Each recipe serves a family of 4. Larger families or families with bottomless pits (also known as teenage boys!) will need to adjust the plans and ingredient amounts to meet your family’s needs. There are a variety of additional items you’ll need to have stocked in your pantry or purchase at the grocery store like chicken broth, butter, eggs, milk, spices, etc. All of these items are too expensive to purchase at Costco or come in way bigger containers than needed for these 21 meals. Subscribe to our free weekly recipes email newsletter so you don’t miss any exciting new plans and recipes! ! Make it simple…with 1 of these 2 packages! One of the most challenging parts to pulling together a large number of meals like this at once is knowing what to do first, next, then and last. When you do things ‘out of order,’ it really can mess up the assembly process and cause you to waste a.lot of time in the kitchen. I’ve created several new printables and instructional videos that will actually make the assembly as smooth and quick as possible for you. Seriously, I might have done a celebratory dance when I finished the assembly…and you will want to as well! Instructional Assembly Videos – exclusive access! You don’t need to purchase this if you purchase the Complete Package above! 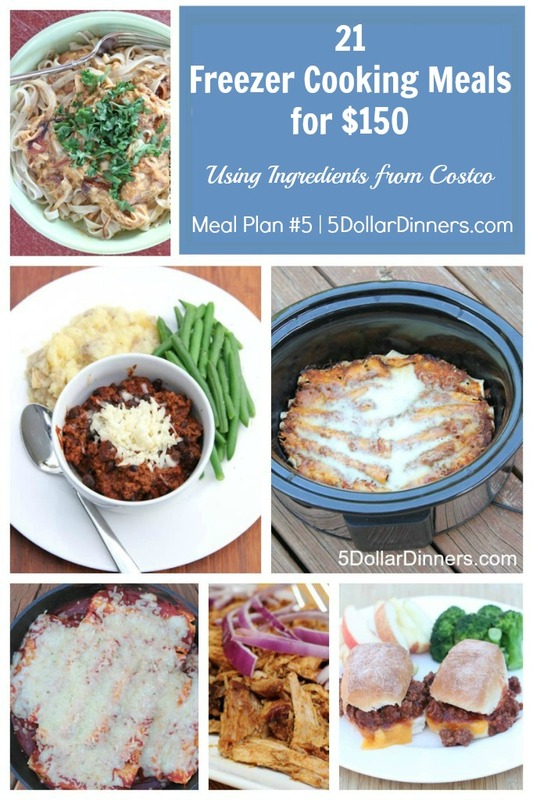 You can find the ALL of the Costco Meal Plan Printables, plus more in the new E-store page. Once you’ve chosen all the ones you need, you can checkout and get all the printable at once! This all looks great. In the future, I am hoping that you might consider a vegetarian Costco meal plan. Please? Can you email me please when you do the vegetarian one? Or one where you can mix and match. We eat chicken and Turkey and vegetarian meals. Thank you! I’d also be thrilled with a vegetarian option. Me, too! I purchased a previous pan, but hubby really wants vegetarian! I have already printed off the recipes and shopping list and bought meal plan #4. I am excited about #5! I am wondering, how or where do I find meal plans #1-3? Hi, i did my first big freezer slow cook pack thing recently and it has been amazing! I have however found your recipes very bland for us, but that’s ok – next time. I’ll add more spices and stuff as i go. We have a Costco where i am but im not a member so i just shopped at my regular pkaces – did make it harder. I am wondering if you know whether. Costco is the same all around the world as we are in australia and wondering if worth joining so we can do your plans to the letter? Thanks for any advice! I would imagine that even if they sold the exact same packages, the prices would be different in AU vs the US. I agree. My family wanted more flavor. We are using the meal as a base and adding to it during the cooking process. I am wanting to try the Costco meal plan, but I guess I am confused, do you have to purchase the plan as well as download the shopping list etc from the site? Yes, there are 2 different printable packs available for purchase with all the information you need. One has just the full recipes and shopping list. 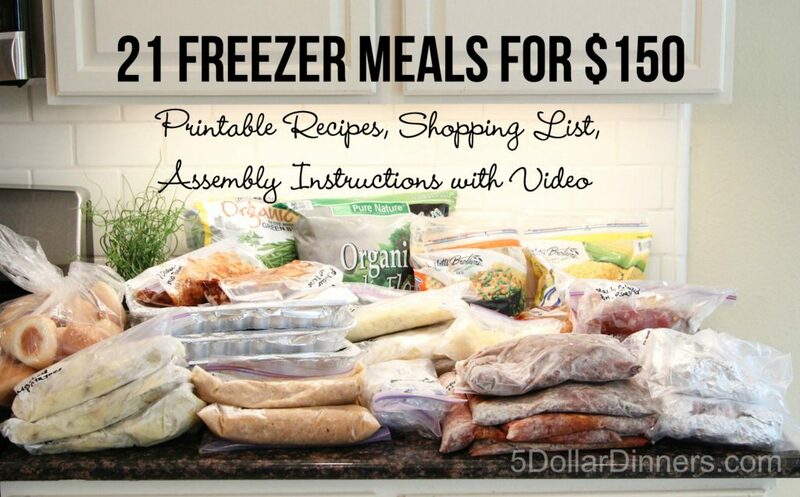 The other one ($5) has the full recipes, shopping list, assembly instructions to make all 21 meals in one sitting, video tutorials, and printable freezer labels for the meals. We did the gluten free crock pot freezer pack and mostly loved it! the videos were fun but slightly hard to follow so I’m looking forward to the new ones. My only real complaint was prepping everything at once in one bowl (a bag of apples) and the recipe calling for like 2 apples. we found that towards the end of our really long night we didn’t have enough for everything. we still wound up with 18 bags of awesome healthy dinners that were easy and ready to throw in the crock pot on my way to work and come home to awesome dinner. We’ve only not loved one meal so far, and it was just for too much BBQ sauce. otherwise, they have all been hits in my house. Hi there. I have seen so many of these great meal plans and really want to try this one. About how long does it take to prep the meals after you finish shopping? Amy – it took Erin about 4 hours to do in one sitting. Yay!!!! Oh thank you thank you thank you! We are in the middle of the other freezer meals from Costco and are loving them!!! These make my life soooo easy! My husband thinks they are such a good idea, he likes to join in on the fun of making them! I enjoy getting meal ideas and purchasing ideas for Costco from these plans, but in the D.C. metro area at the Costco closest to us (located in Chantilly, VA – I haven’t been to any of the other Costco stores in the area) the prices are higher on almost everything and there are quite a few ingredients that the store doesn’t carry! For example, they don’t sell any tortillas, organic broccoli, organic green beans, or organic black beans. We try to buy mostly organic and this was our reason for getting a Costco membership, so this is definitely a disappointment. But thank you for all the work in putting these together, there are great to start from. I was excited to find this site! However I was a bit too excited. I went to Costco and purchased everything on the shopping list, returned home to get started. I then realized I had to purchase the plan to get the instructions. Which is fine, i don’t have a problem with paying people for a great service they provide and have taken the time to develop the service. So I paid for the package and now I cannot get anything! Cannot “login in” to print what I paid for. So very frustrating! No only did I lose the package fee but I have $150.00 worth of food that I now need to prepare and use so I don’t waste it. I’m a fool! I did the same thing!! I want to purchase the instructions and such! I finally was able to access the file. Now I will begin. I apologize for being so negative in my prior post. I was just so frustrated with the thought of wasting all the time and money. We’re good now! As stated above, each meal feeds 4 adults. Has anyone ever expressed that they also have a BJ’s card and the meals worked for them? Suzanne – you can definitely shop at BJ’s instead. The prices and quantities might be different so be prepared to adapt as needed. How big of a freezer do you need to store all this? Erin uses her regular size top freezer in her kitchen. You can save room by flat freezing etc. I’ve only done one meal so far and it was great, but I’m about to try to make one of the ones without any liquid. How do I measure out how much water to put in the crock pot for that? It has to have se liquid, but how much? You do not additional liquid as the meat and/or apples (if used) provide enough moisture. If you want to add liquid, then add a cup or so of broth or water as you desire. Please help! Ive been trying buy the assembly instructions for meal number 5. I got all the groceries I need and printed out the recipes? What should I do? Reduce costs by making your own chicken stock from those rotisserie chickens. Cover carcass with water, cook until the meat falls off the bones. Bag & freeze flat. I have gotten 16 cups (equivalent to 8 cans) from one chicken. 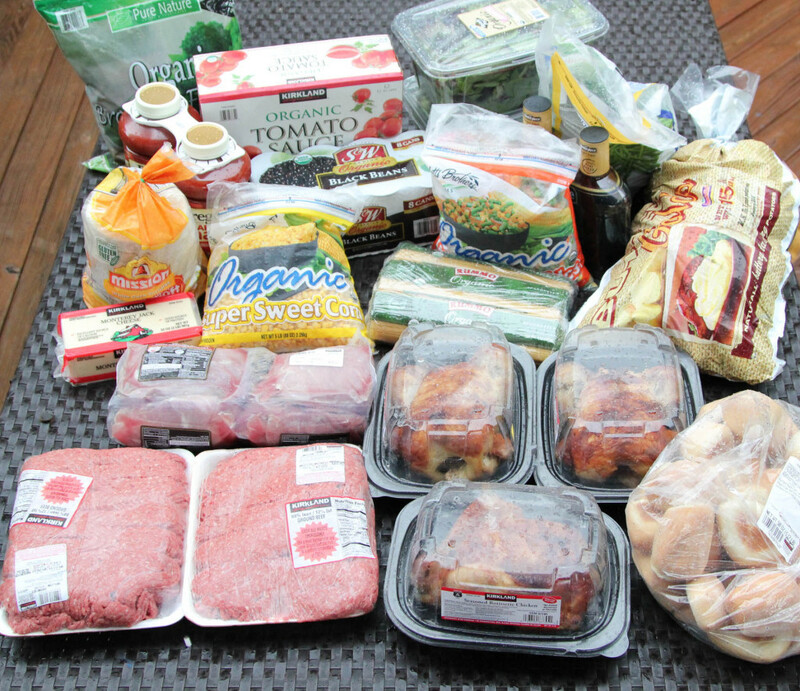 I had purchased this meal plan last week, and we cooked it all up on Friday. It took around 5 hours – part of the issue was the iPad we were using wasn’t allowing us to fast forward/rewind the video correctly and other parts of it we were discussing and missed steps. Halfway through we turned off the video and just went by the instructions. In the video, it shows only one batch of chili being prepared – but make two, I wish I had of known it, we only grabbed 5 bags and figured the rest of the chili would come in with the second batch of ground beef. But whatever, there is a disclaimer but it did come too late in the video since we had no leftover meat to make two instead of one bag. On top of that, we grabbed ground pork instead of beef – my bad. But we used it anyways and everything tastes good so far! We ate the sloppy joes tonight and they were awesome (again with ground pork). We tasted a bunch of the other stuff (the stuff that was cooked anyways) and it all was very tasty. Overall a good experience, next time I think we can get it done even faster, we spent too much time stressing over watching the video and keeping up with it/or being too far ahead. Would highly recommend!!!!! I forgot to add a sign note – I am from Canada, we spent around $200, $150 at Costco and $50 elsewhere plus we had cheese and spaghetti on hand. I think next time I could spend less, by watching for sales and stuff. Costco did not have tortillas for that amount, it was $4 for 15 big ones, I got them at the local grocery store but for much more money. And I do feel I didn’t need to buy all these vegetables, maybe just two bags, mixed and corn next time since we have a few good easy side dishes at home as well on hand. I have only done one meal so far and it was great!. I always want to try to cook new dish at least once in a week. And I’m so excited when I see new recipes in other websites or in magazines. Are you going to have any more of these plans for Sam’s? We might in the future, but these meal plans can be adapted for any store and would be easy to do at Sam’s since it’s a warehouse store like Costco. Erin, add me to the list of people who are delighted you are planning to do a vegetarian plan! What’s the difference between “Freezer Meals” and “Slow Cooker Freezer Packs”? Having to add the potatoes right before cooking makes these recipes much less convenient than I was expecting: I was looking for recipes where I do all the labor now and then just defrost and cook, but now on top of having to prep potatoes before cooking, I also have a TON of potatoes NOW that I need to use up before I actually am planning to use the frozen meals or they’ll go bad, and then have to remember to shop for potatoes before I make the potato meals.